When retreating to a tropical island to escape your day-to-day routine and miserably average weather, packing in as much time by the pool can understandably become your no. 1 priority. Thankfully, you'll soon be able to squeeze in a few more precious moments of vacation when you visit the Dominican Republic, now that the country's largest airport is building a brand new lounge with an outdoor pool that's basically on the tarmac. This new amenity, which is part of a new VIP lounge area currently under construction at Punta Cana International Airport, will allow special guests to make a pit-stop for one last dip in the water before boarding. 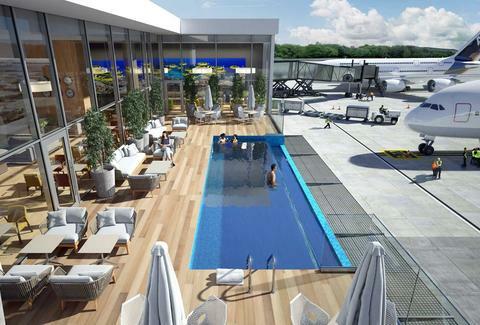 Besides a refreshing swim, visitors will also get to watch take-offs, landings, and taxiing jets on the tarmac, which sits just beyond the pool's infinity edge. Sure, whiffs of diesel fumes and insanely loud engine noises may not seem like your idea of relaxation, but compared to huddling around a crowded gate trying to charge your phone, it sounds like heaven. As you can see from the renderings (shown above), the new private respite areas will be a wonderfully cushy spot to recharge and come to terms with the fact that you have to leave the DR. You can't just walk in without permission, though. 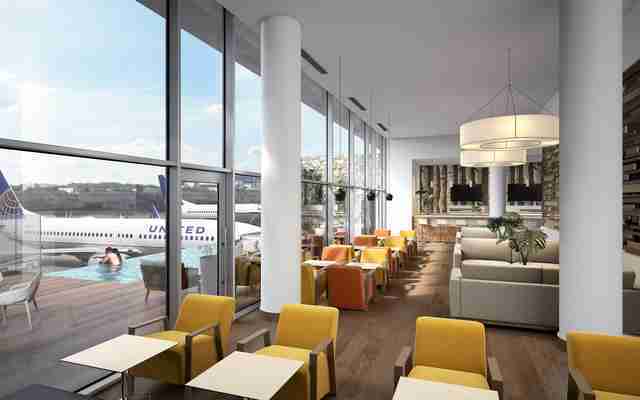 As is the case with most airport lounges, you'll need special status to gain access. Specifically, once it opens its doors in December, it will only be available to first and business class passengers, certain homeowners and club members, and regular folks who've paid the $125-per-day fee to hang out there. Luxury amenities like spa-style showers, private bars, and fine dining areas have become commonplace in top-tier airport lounges around the world, but it's tough to imagine outdoor pools catching on anytime soon. After all, the last thing anyone sitting through a layover at O'Hare or JFK wants to do is go change into their swimming suit. This article was originally written by Joe McGauley and appeared here.